(Bloomberg) -- U.S. stocks are no longer a better bet in a sell-off than their international peers, according to Morgan Stanley. 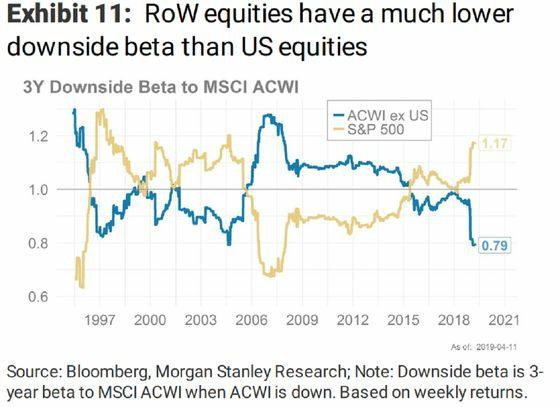 The S&P 500 Index’s downside beta to the MSCI AC World Index, a measure of its relative return when global shares fall, is at its highest since before the financial crisis, strategists including Wanting Low wrote in a note to clients. The same measure for stocks from the rest of the world has slumped to multiyear lows -- making them more defensive, they said. “This means that U.S. equities sell off more than the rest of the world during a broad market drawdown,” the strategists wrote. These findings clash with a commonly held belief that U.S. shares would sell off less severely in a broad market slump, as they are regarded as higher quality, the strategists said. The S&P 500 is up about 16 percent year-to-date, to within 1 percent of its all-time high, as investors bet a dovish pivot from global central banks will help delay any potential slowdown in economic growth. That’s better than the 12 percent gain in the MSCI World ex-U.S. Index. The shift in downside betas will call into question what qualifies as defensive, should the market sell off, the strategists said. “Over the past three years, the S&P 500 has been a higher-beta market and has sold off more during a broad equity market sell-off,” they wrote.